BRIAN WILLIAMS, anchor: President Obama was in Michigan today trying to leverage the government's bailout of the auto industry into political support in some crucial Rust Belt states in this country. NBC 's Kristen Welker with us tonight from Lake Orion in Michigan . Kristen , good morning. WILLIAMS: Kristen Welker on the assembly line in Michigan tonight. Kristen , thanks. 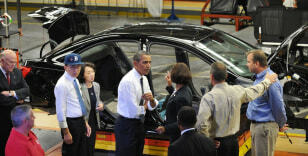 President Obama and South Korea's President Lee Myung-Bak listen to plant manager Alicia Boler-Davis(3rd R) during a tour of the General Motors Orion Assembly plant October 14, 2011 in Lake Orion, Michigan.